In the dark days of NYC politics, there were a select few making back-room deals to further their personal goals and enrich themselves over the people. Corruption and cronyism were rampant. Reformers lifted the veil on these political fixes and enabled candidates from all backgrounds to successfully run grass-roots campaigns to allow voters to decide who gets to represent us. Volunteers from the Samuel J. Tilden club have been carrying nominating petitions in ST/PCV and the neighborhood for the past six weeks. These petitions allow for candidates to appear on the ballot, and to ultimately present themselves before the voters who will be able to make a choice of who among those running will be our next representative. While there are several people who have announced their candidacy to replace the term-limited Mr. Garodnick, it is this diversity of choice that keeps the process transparent and free from corruption. It is now the difficult task of these candidates to earn our votes. We encourage everyone to participate in the process and become informed citizens by participating in the political discourse. Go to a forum, ask questions of the candidates and understand their individual experiences and capabilities. This is how we should elect our next political leaders: out in the open. By now you have heard, ad nauseum, about the indictments and resignation of Sheldon Silver as speaker of the New York State Assembly. Assemblyman Carl Heastie from the Bronx has been elected as speaker. The stunning downfall of Mr. Silver is very sad on many levels. On a personal note he has been a friend and an ally. I believe that as the leader of the Assembly for 21 years he accomplished much. Notwithstanding the charges of personal corruption alleged against him which a court must ultimately decide, I believe that from a public policy standpoint, Silver leaves his post and the state better off than he found it. But if his arrest and fall from grace is the ultimate result and legacy of this year’s legislative session in Albany that will be sadder still. Reform is needed and badly. And if not now, when? The public needs to have confidence in its elected officials and its government institutions. Plainly said, today they do not. The road to reform does not begin and end with the State Assembly; it must go through the State Senate as well as the governor’s office. Reform does not mean replacing one leader for another; it means systemic and enduring changes that will hold public officials to a higher standard of conduct. And it will mean that current office holders, including the governor, will have to sacrifice some of their current and cherished prerogatives. Just eight days after the arrest of one of Albany’s famed three men in a room, came the news that another one in the power trio, Republican Senate Majority Leader Dean Skelos, was also being investigated. U.S. Attorney Preet Bhahara, whose investigation into Sheldon Silver led to his stepping down as Assembly speaker on Monday, is looking into Skelos’ ties to real estate and outside income from a law firm, the New York Post reported. Skelos, of Long Island, has since reportedly laughed off the allegations. 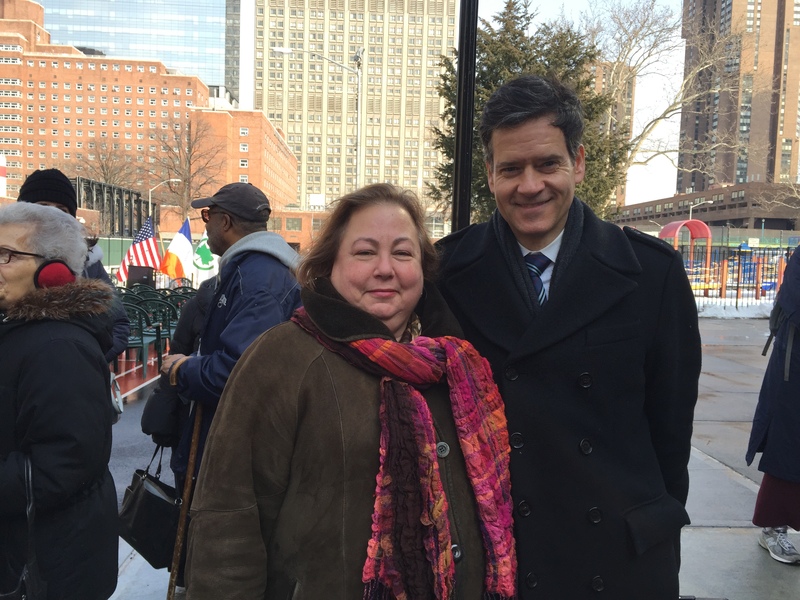 Meanwhile, at the ribbon cutting for the new Asser Levy Playground in Manhattan on Friday morning, Town & Village cornered a couple of local state senators as well as a few community leaders to ask for their thoughts on the latest scandals from the Capitol. Senate Senators Liz Krueger and Brad Hoylman both told Town & Village that it’s a shameful day in Albany any time there’s news of alleged criminal activity. When asked if she was just relieved it was a Republican on the hot seat this time, the Democrat senator insisted she wasn’t. After a whirlwind week that began with an arrest of one of Albany’s most powerful men and is ending with Sheldon Silver no longer having the title of Assembly speaker, what has remained up in the air is just how much actual legislation will get done as Albany is distracted by the implementation of a new speaker, and possible implementation of a new, more egalitarian power structure. While not one to complain about reforms in Albany, the timing is naturally a concern for tenant advocates like Mike McKee, treasurer of TenantsPAC, considering the rent laws are scheduled to sunset this June. Two weeks ago, when news of an investigation into an alleged long-running bribery and kickback scheme perpetuated by Silver started to surface, McKee said it was too soon to predict how it would affect one of Albany’s “three men in a room” – or tenants. But as of Monday evening, some of Silver’s fellow Assembly Democrats were calling on him to resign and an idea that had been floated a day earlier to appoint five Assembly members to act as speaker while he worked to beat the rap against him had fizzled. Democrat legislators calling for him to resign early on included Comptroller Scott Stringer, State Senator Brad Hoylman and in the Assembly, Democrats Brian Kavanagh and Keith Wright. “He should understand that he’s lost the confidence of a majority of our conference,” the New York Times quoted Assemblyman Brian Kavanagh as saying of Sheldon Silver after a closed-door meeting on Monday night. Kavanagh did not respond to calls for comment from Town & Village. However, by Tuesday night, Silver’s ouster (or resigning) as speaker along with an announcement that a replacement would be coming soon was pretty much a done deal, according to published reports. Assembly Majority Leader Joe Morelle will be interim speaker until an election is held on February 10, according to City & State.